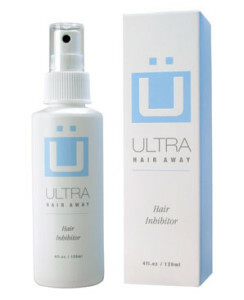 Ultra hair away goes a step beyond the average hair removal cream. This cream does not simply remove the unwanted hair, but instead works to inhibit hair growth so that you will no longer have unwanted hair at all. Ultra claims that with proper use of this product, hair growth can be eliminated in just two weeks. In addition to the ingredients necessary for inhibiting hair growth, fruit derivatives are a great addition to this product due to their moisturizing properties. While it may be possible to achieve results in as little as two weeks, the average consumer has reported not seeing results until a month or two of use. The thicker the hair growth, the longer it will take to eliminate the hair growth. So far, there have been no reports of severe allergic reactions. If you are looking to eliminate hair growth without costly procedures such as laser surgery, this may be the product for you. With diligent use and taking the time to apply the hair removal product evenly and as directed, it can indeed completely eliminate hair growth! The only downside that has been found with this product is the length of time to eliminate hair growth and the amount of the product that has to be used. It is advertised that with proper application on a large area, such as the entire body or a majority of it, one bottle will only last one week. Keeping this in mind, one would need a new bottle approximately every two weeks to eliminate hair on half of their body, such as on both of the legs. While this has caused many customers to be unhappy, the total cost of the hair removal by using Ultra Hair Away is still far cheaper than laser hair removal procedures!